Cuphead was this year's most requested monster review for the Halloween season, but there's another name in gaming drawing from a similar well of influence to entirely different effect, and not only is it more appropriate for the ongoing Horrorday season, but kind of feel like it just found its tonal and stylistic groove. 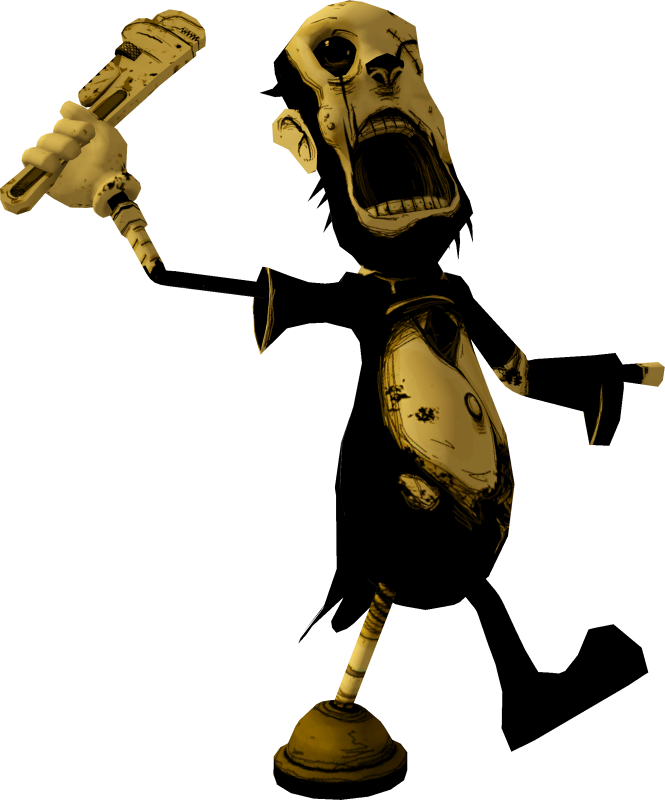 Set in a crumbling animation studio, Bendy and the Ink Machine's still cryptic storyline hints at an attempt to give life to the inanimate and bring demonic entities into our world through the animation medium and the titular "ink machine," capable of producing a seemingly infinite volume of "ink"...or something like ink. We really still don't know every detail to the story, and we're not going to go into plot analysis here, but it's been interesting to see both this game and its fandom develop concurrently, which we'll get into a little as we look at the monsters and villains thus far. 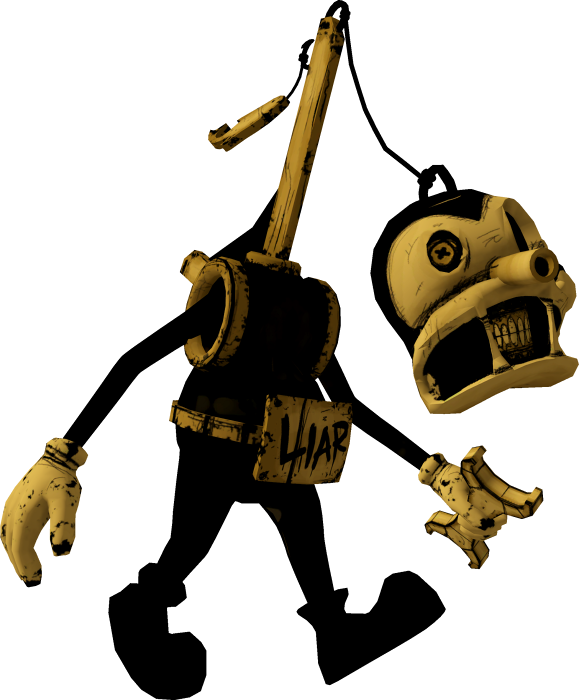 The first thing we ever see crawling out of the Ink Machine's goop is, of course, a crude and monstrous semblance of "Bendy" himself, already a cartoon caricature of the devil or at least a devil. "Demons" aren't typically among my favorite explanations in a horror narrative, and I'm still not sure the theme is completely, totally necessary to what's already a good enough tale of unnatural cartoon-monsters, but I certainly find these demonic entities more interesting than most. It's all about the execution. There are some who might feel that this design goes a little too hard. I can see that, sure, and it's a sentiment I've held about many other creature designs myself. 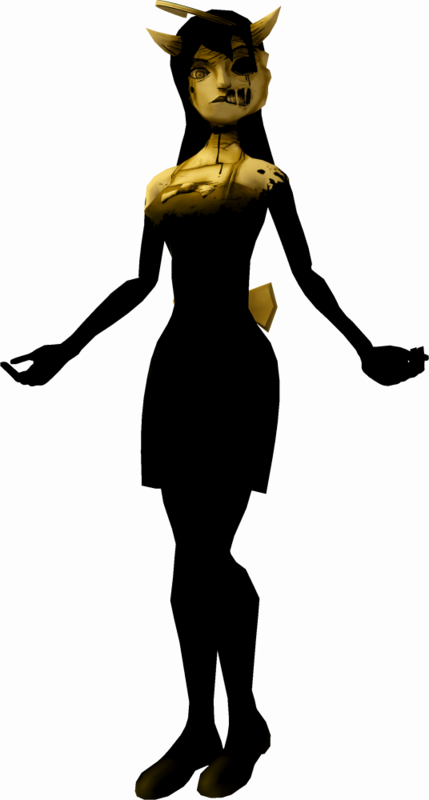 This design is scary and menacing in obvious ways where a perfectly on-model, "cute" little representation of Bendy may have been plenty jarring enough to encounter as a living, three dimensional entity. This design, however, still feels reasonably fresh and different to me among the throngs of modern horror icons, in and out of video gaming. The face half-drenched in ink is a cool, easily memorable image and it's overall exactly what I would expect from an imperfect, living manifestation of a cartoon being. 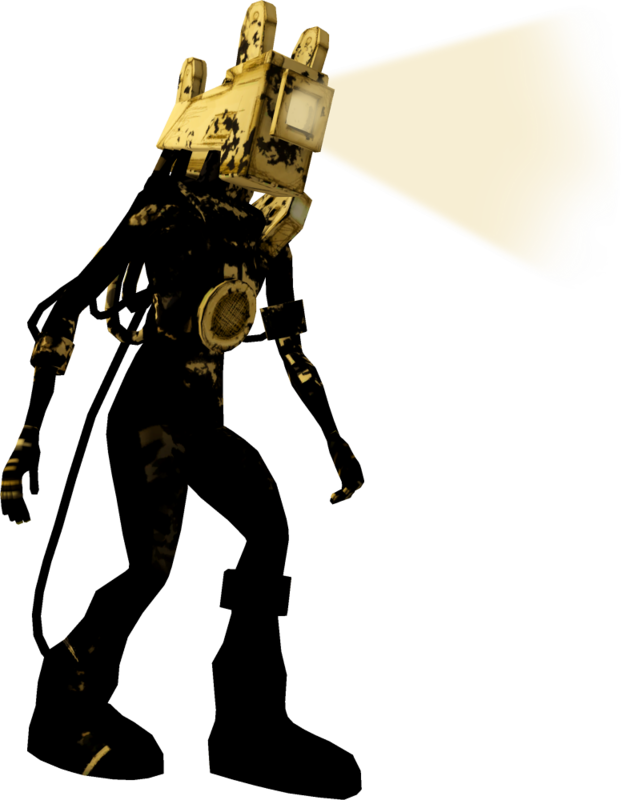 If we ever do meet a "perfect" Bendy in-game, it feels like something best reserved for the final chapters. Introduced in the second chapter, searchers are a sort of enemy design I've always come to think of as a "mudman;" any liquid creature with a humanoid upper body and dripping pool where it ought to have legs. 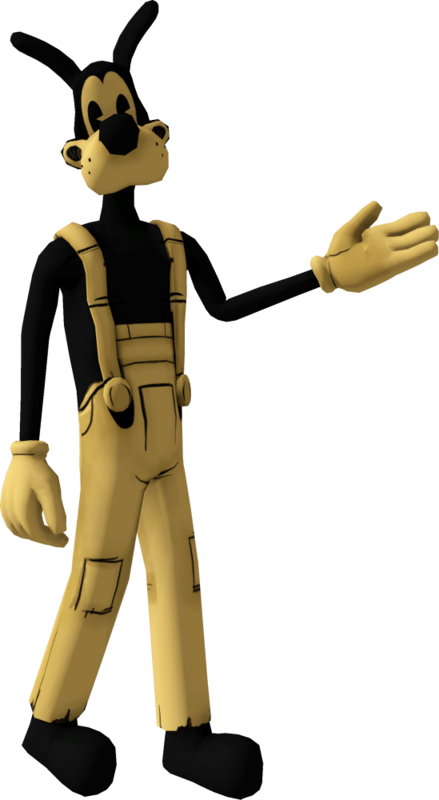 It's a common template, and the "searchers" don't attempt to elaborate on it, which was almost a little concerning after pseudo-Bendy demonstrated a decent level of imagination. Still, something's gotta be the lowest-level mook here, and these simple, faceless figures of living ink fill their role well, implying even less "finished" or "evolved" Ink Machine beings than others to come. As of the third chapter and graphical updates to the first and second, their proportions and animations actually got just a little livelier and cartoonier than the more straightforward human outline they were introduced with. Appearing in the second chapter, Sammy was once in charge of writing music for the original Bendy cartoons, but was at some point transformed by the Ink Machine - or the things that came out of it - and now worships Bendy as some sort of demonic god. It's all very classic Occult Horror Cthulhu-esque stuff, again not usually my biggest cup of tea, but the fact that this is all revolving around Fleischer-esque cartoons is a lot of fun. It's a theme we've only seen in a few Disney creepypastas up to now, and they didn't elaborate much further beyond "there was this one really messed up Mickey cartoon!" 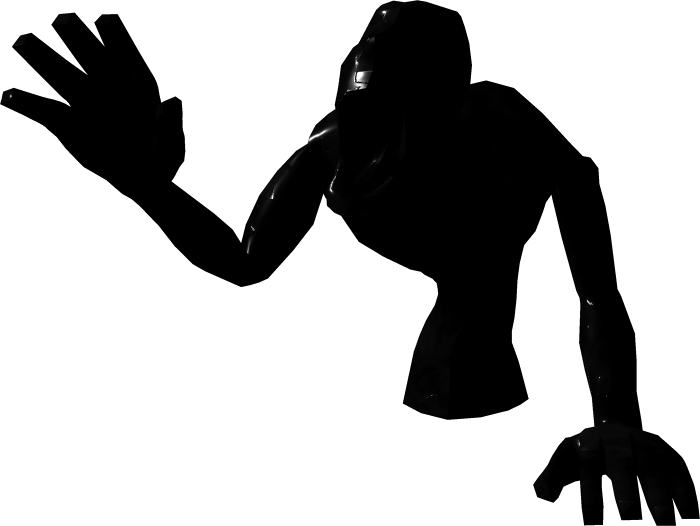 Still, you can see how these first two chapters of Bendy seemed to err more on the side of dark, gritty Hollywood style horror than anything else, avoiding too much humor in favor of more traditionally threatening slasher-looking villains and the zombie-like searchers. Meanwhile, the Bendy fandom - bearing in mind I'm an outsider looking in, here - looks like it began to crank out a downright overwhelming volume of its own content from day one, and most of it has taken a whimsical tone than the series itself seemed to be heading. Interest in the "demon worship" aspect of the storyline took a rather abrupt backseat to the "living cartoon" aspect, and that's fully understandable. We've all seen plenty of gore, ghouls and demons in this genre, but Bendy and his friends are cute. Cute is fun! Cute can be scary, too! 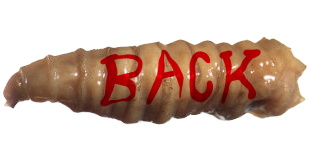 I'll say now that I still would have supported where Bendy appeared to be headed. Whatever its tone, I thought it was shaping up to be a cool story and admirable independent project...but the final shot of Chapter Two definitely implied some more fanciful developments, and when Chapter Three finally dropped during the Halloween season, things took a pretty stellar turn for the wacky. Boris the Wolf is one of Bendy's two sidekicks in his in-universe cartoon shorts, and let me just say I love seeing a wolf more reminiscent of Goofy than their cool and romantic image in everything else. In chapter one, we come upon the eviscerated corpse of a Boris lookalike, but in the final shot of chapter two, a living specimen seems to greet us with no violent intent. When we begin the third chapter? Boris, while incapable of speech, is our full-fledged sidekick. We get to see where he's been living and we even get to feed him soup. How adorable is that?! As we could basically figure out on our own, this Boris turns out to be the latest in a whole line of less viable Borises. Chapter Three soon springs on us three more characters from the Bendyverse, a trio of what are presumably "villains" or "rivals" to Bendy, consisting of a sea captain named Barley, a smartly dressed ape(?) named Charley, and some sort of giant spider named Edgar. At least, I'm not sure what else has fangs, a fat body and long legs besides a cartoonified spider. This is the living, monstrous version of Charley, or would be if something hadn't presumably gone terribly awry with the process and resulted in a mindlessly feral, distorted ink-mutant. This is the most "normal" looking of the three, and it's already the game's most outrageous design up to this point. Maybe some people feel this is just another "trying too hard" sort of design, but come on, live a little. There's a time for eerie subtlety and a time for going coo-coo bananas, and I think we all know which one befits a game in which cartoons take possession of flesh-and-ink bodies. I love Piper's plunger leg, his over-the-top horrible face and especially how scribbly and sketchy that texturing gets. It's frankly gorgeous. The monster form of Barley goes even more over the top. I know I'm sounding like a broken record here, but this is a case where it's pure fun to get hit over the head with "THIS IS A SCARY THING." It remains just silly enough to make that work, and grisly in a fun, inventive way. I really like the head dangling like a tetherball. I've genuinely never seen that before in a design, somehow. Edgar's monster form is the least recognizable of the three, to the point that I wasn't originally certain he was supposed to be the same character. He looks more like some sort of monkey here than a spider-like animal, but I'm loving the real eyeball in a real socket contrasting with his "cartoon eye," and the horrible chattering teeth on the top of his head. 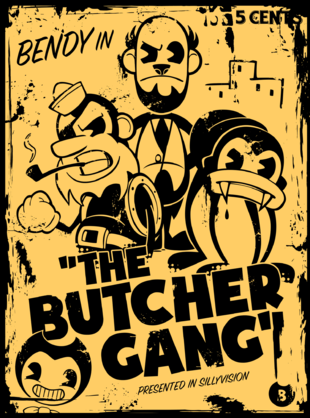 This is definitely my favorite of the three, and while their impact fades significantly as you battle a dozen clones of each, the Butcher Gang feel like the exact point at which Bendy and the Ink Machine really finds its aesthetic; a perfect balance between the feel of these old cartoons and a more modern horror title. 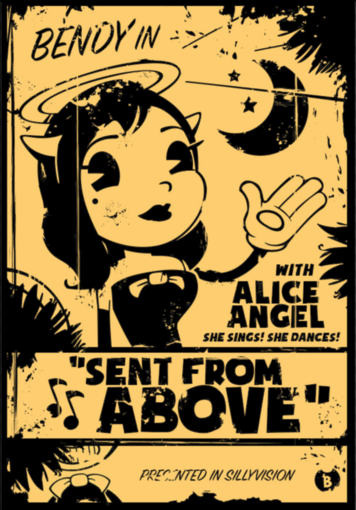 Posters as far back as the very first chapter introduce us to Alice Angel, and I can't say she feels as "authentic" to the Fleischer-era style as our other characters - you didn't see a lot of horned, fallen angels in older media in general - but throughout fan materials, I'm seeing a lot of presumption that Alice would be the sweetest and nicest of the three core characters, possibly even a "good" one in opposition to Bendy himself, and I'm glad those expectations get so thoroughly dashed. Instead, "Alice" turns out to be the closest thing to a "main villain" we've seen thus far. "Bendy" doesn't even speak, behaving more like a mindless monster, whereas "Alice," whatever she truly is, spends much of her appearance regaling us with dramatic exposition. We learn that she's supposedly masterminded much of what we've previously encountered, that she's been experimenting with the creation of more ink-beings in an ongoing attempt to perfect her own form, and that she doesn't seem to draw a strong line between her character and her character's voice actress, implying that, perhaps, she may even be a physical mixture of the two. She also remembers, with horror, her time living in the "dark puddles," something she describes as a "buzzing, screaming well of voices" in which "bits of your mind swim like fish in a bowl," a pretty fascinating, frightening insight into the nature of the "ink" and far more inventive than the early fan presumptions that these were simply ancient demons summoned up from hell, or something. Alice also discusses the larval "slug" she once was when she first escaped the maddening limbo of the ink, presumably one of the searchers or something even simpler before she evolved into what she is now. Alice is another design on the more "typical" horror side, as is her classically diabolical personality and ravings about "The Ink Demon," but you really have to see and hear her in action to appreciate the carefree, Saturday-morning-supervillainway her character has been executed. There's a campy appeal to her that a bigger horror series from Capcom or Bethesda might have shied away from, and I'm perfectly content adding this half-melted ink woman to the pantheon of video game villains. ...But, hey, if you still want more "serious" monsters than all these lovable creepos, Bendy's got you covered there, too, with its own answer to the plodding, silent Pyramid Head or Nemesis figure now so classic to horror gaming, and the image of an ink-dripping human body with a rolling, flickering projector for a head is plenty ominous without straying outside our Cartoon Studio theme. This monster even came dangerously close to being cut from the final release of Chapter Three, but hiding from him was deemed fun enough to be left in, and I'm really glad. Bring up Bendy and the Ink Machine in some corners of the internet, and you'll hear at least fringe whispers of phrases like "fandom bait" and "deviantart" and - ugh - "cringe material." I don't know about you, but I've been tired of that attitude since at least 2005. Can we just...stop that? Can we stop being weird about things people make and consume for fun? Both this series and its fans have unapologetically embraced all the melodrama, absurdity, and well, cartoonishness promised by its very premise, and I love seeing that. Even where I'm not a part of it, I'm glad people are making and celebrating what they want, the way they want, without concern for that now basically unnavigable maze of "sincerity levels." "Is this not sincere enough?" "Is this trying too hard?" "Is this self aware enough?" "Should I pass this off as ironic so nobody makes fun of me?" Stop. Pleeeease. Just stop it. Just like things or don't like things. Let everyone else take stuff as seriously as they want to. 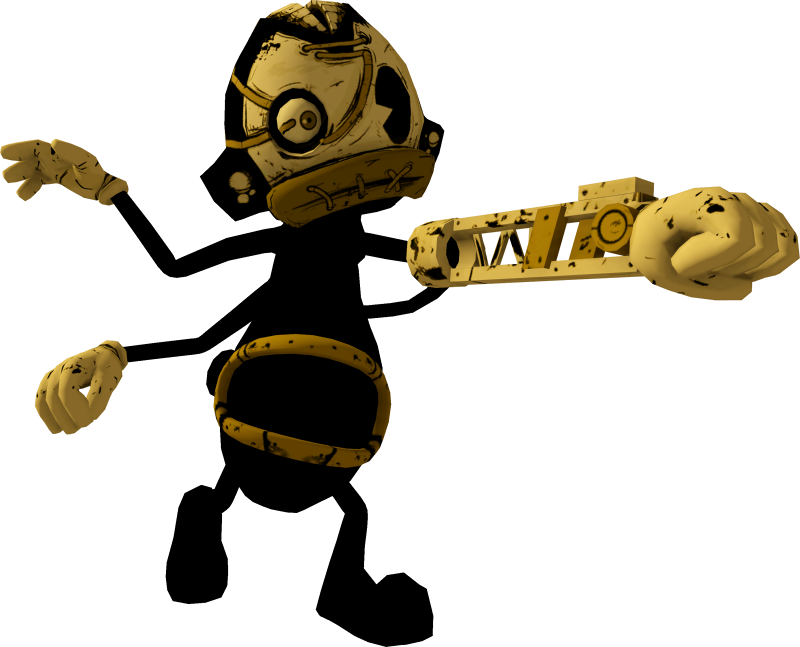 I like Bendy. I also still like Five Nights at Freddy's, and I still like Undertale. I'm not a part of any of these "fandoms," no, but I still see just as much fun, cool and clever stuff coming out of them as anything people are complaining about. Like I said before, live a little. There's still one more thing I want to say here, because I compared the Projectionist to Pyramid Head up there, and in fact, everything we've seen here really reminds me of the expectations I originally had for the Silent Hill series. After the first two games showed us monsters and motifs so "personal" to the player characters, I suspected further titles might experiment with more unusual, more specific themes, really getting inside the heads of radically different protagonists. 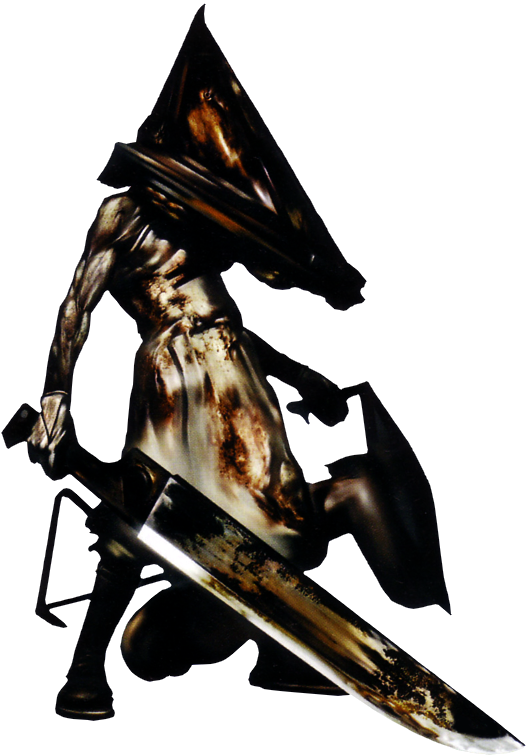 Had a Silent Hill game ever featured a cartoonist as its player character, we basically just finished reviewing a perfect set of enemies and bosses for them to face off against. 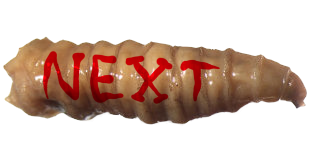 I used to feel pretty down about Silent Hill's creative decay and ultimate demise, but who needs it anymore with so many new, independent creators picking up the creative slack?